Find the right places to eat and drink nice and inexpensive in Berlin. Restaurant guide How do I get around in Berlin? Read all about it in our access guide. What is there to do? Take a look at our culture guide to learn more. The Berlin accommodation guide offers you the finest hotels in Berlin Germany. We guarantee you lower prices, and will find the best accommodation in Berlin for you. 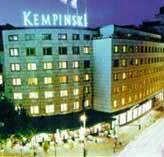 The Kempinski Hotel Bristol is a Luxury hotel located 6 miles from Berlin- Tegel and Tempelhof Airports and 17 miles from Schonefeld Airport. Known to locals as 'the Kempi', the Kempinski Bristol is located on the city's most beautiful street, the Kurfürstendamm. The distinctive semi- circular building combines the classic with the modern, to provide a home for the finest traditions of hospitality.